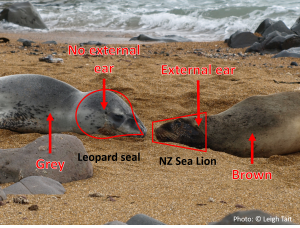 Leopard seals are referred to as “rapoka” (Beattie 1920) or “popoiangore” (Williams 1957) in Māori . They are part of the family of animals scientifically named ‘Pinnipeds’. 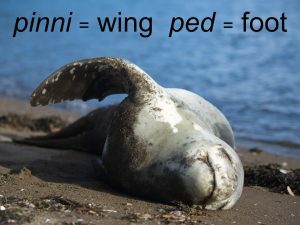 This Latin translates to ‘wing-footed’, referring to the ‘wing-like’ shape of the fore flippers of seals, sealions and walrus (the pinnipeds). Leopard seals are also known by the Latin name Hydrurga leptonyx, where hydrurga means “water worker” and leptonyx is Greek for “small clawed”. 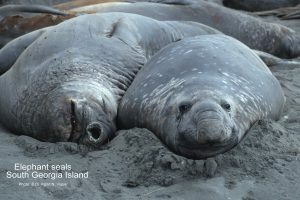 They are the second largest seal found in New Zealand waters – the largest is the Southern elephant seal (Mirounga leonina). 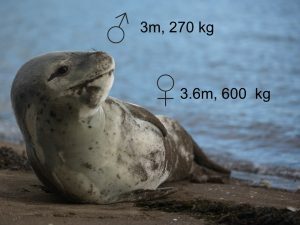 Leopard seals have a head that may appear to be disproportionately large compared to their bodies. Leopard seals belong to the group of pinnipeds known as the ‘true’ seals (or phocids). 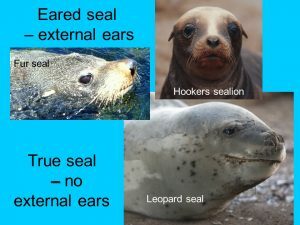 Unlike the ‘eared’ seals, phocids have no external ear pinnae. 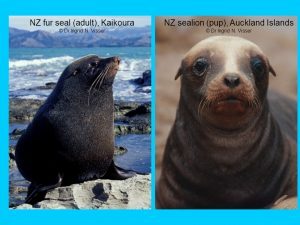 There are two types of ‘eared’ seals which are commonly seen around the New Zealand coastline; the New Zealand fur seal (Arctocephalus forsteri) and the New Zealand sealion (Phocarctos hookeri). Williams, H .W. 1957. A Dictionary of the Maori Language. New Zealand Government Printer, Wellington. Beattie, J.H. 1920. Nature lore of the Southern Maori. Transactions and Proceedings of the New Zealand Institute. 52:53-77.